The Scrapbook-advice.com Firefighters layout Gallery is here to allow our readers to posting your scrapbook layouts about your own personal Firefighter Hero. 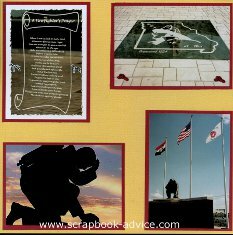 The layout on the right has a photo of the Firefighters Prayer that is part of The Fire Fighters Memorial of Missouri. It's a simple layout, and while it does not honor one specific Firefighter, it does recognize that they are dedicated to their profession and some have paid the ultimate price. You will post your layout using the form below. You can enter up to 4 images with each form. Please tell us in the description area, why you did your layout and a little about your Hero. Then we would like to know what items you used for your layout (if you can remember) and maybe where you got them. Did you purchase your embellishments, or make them yourself? Once you have submitted your layout to our Firefighters Gallery, our moderator will approve your layout and comments, and set up a page on the scrapbook-advice.com website. You will then receive an email with a link to that page. We have no one special to honor, but would certainly like to show our readers some of your wonderful pages and ideas for honoring those special ones among us. Don't be shy if you are a beginner. We were all beginners at one time. Show us your personal tribute to honor the service of your special Firefighter Hero. 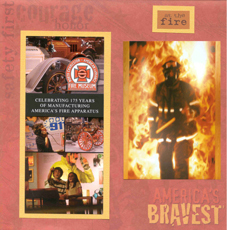 Whether its a Scrapbook Layout or a card with a Firefighter theme, we'd love to showcase it on our website www.scrapbook-advice.com. Enter the Title: Example "My Firefighter Scrapbook Hero Layout about my Dad"
Tip: The images load best if 800 pixels by 600 pixels and 100 mg or smaller.